It’s a friendship that’s making waves around the world. A video posted by Core Sea shows a porcupine fish ensnared in a net in Chaloklum Bay, Thailand. But this fish isn’t alone. There’s a fishy friend nearby who won’t leave the trapped pal — even as a human approaches. Not only can these fish swallow water and raise their spines to make themselves look bigger and fiercer, but they also harbor in their bodies a neurotoxin that contributes to self-defense. "This touching video shows virtuous behavior in two distantly related vertebrates. 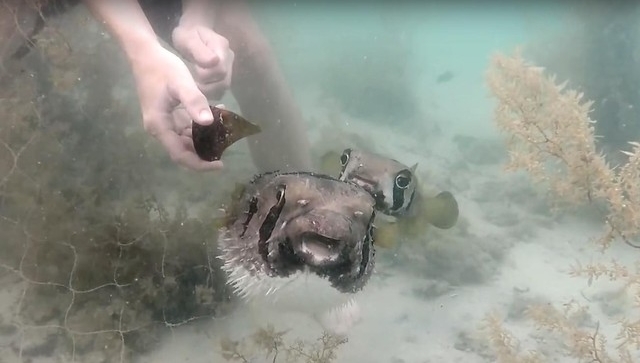 A porcupinefish bravely keeps vigil for his entrapped comrade, while a kindhearted snorkeler gingerly negotiates the situation with an improvised cutting implement — the bottom of a broken bottle. "A skeptic might think the bystander fish is just curious, but if that were the case, the fish would have fled the scene when the large ape approached. Like many fishes, pufferfishes (of which the porcupinefish is a member) can live a decade or more and can form lasting bonds with others of their kind or with human caregivers." Responses to "Porcupine Fish Refuses To Leave His Trapped Friend’s Side"
Very cool! Just wish this had never had to happen in the first place. Humans are such pigs. The positive out of all this is seeing how there was a comraderie between these two fish. Enlightening to say the least!